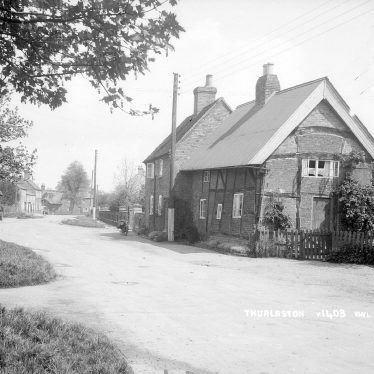 Thurlaston is on the east side of the county, close to Dunchurch and, now, the M45. 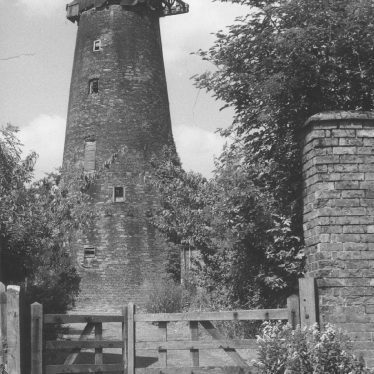 St. Edmund’s church is based in the village and there is also a windmill, now a private residence. 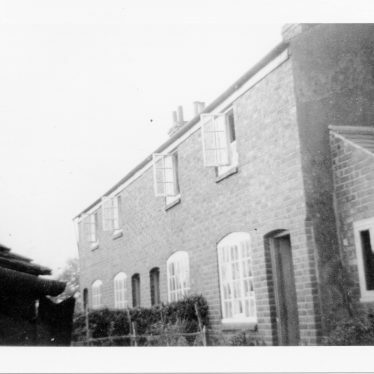 Thurlaston cottages (front views) facing down the row to Pudding Bag Lane. The add-on was a wash house. The site of a manor house that may originally have been built during the Post Medieval period. The house has had many later alterations added to it. 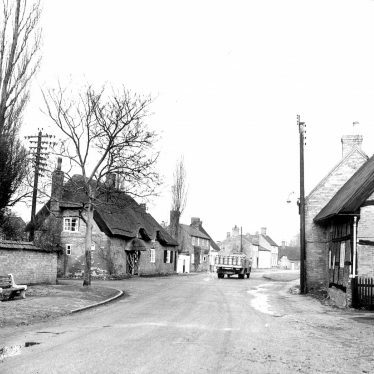 It is situated in Main Street, Thurlaston. The site of a ring ditch of Neolithic or Bronze Age date. It is visible as a cropmark on aerial photographs. The ring ditch is situated 600m north east of Thurlaston. The site of a possible Medieval moat. Some earthworks are visible 300m west of the church at Thurlaston. This area is actually a dammed pond, if there is a moat here at all, then it is a few metres to the north. The possible site of a quarry dating to the Post Medieval period. The site is suggested by documentary evidence and lies 1km north west of Kites Hardwick. The site of a possible ring ditch of Neolithic or Bronze Age date. It is visible as a cropmark on aerial photographs. The ring ditch is situated 1km north west of Thurlaston. The site of a quarry or sand pit which was in use during the Imperial period. It is marked on the Ordnance Survey map of 1886 and is still partially visible as an earthwork. It is situated at the southern end of Thurlaston. The site of a quarry or sand pit that was in use during the Imperial period. It is marked on the Ordnance Survey map of 1886 and is visible as an earthwork. The site lies 100m west of Main Street, Thurlaston. A railway bridge that was built during the Imperial period. 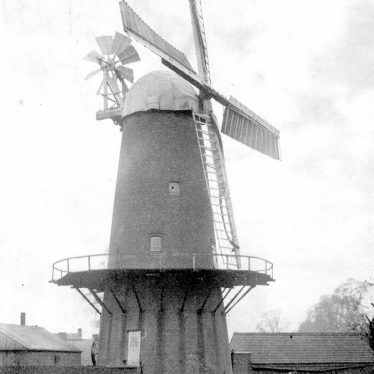 It was built to carry the Rugby to Leamington railway line over the A45. 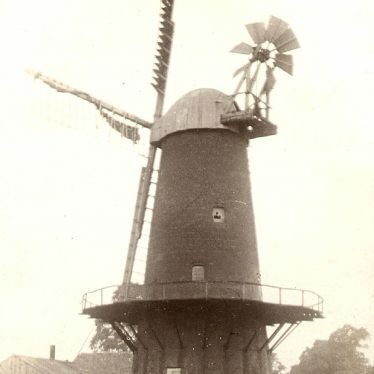 It is situated near the junction of Coventry Road and Northampton Lane. An area of ridge and furrow cultivation of Medieval or Post Medieval date. The ridge and furrow is visible as an earthwork. 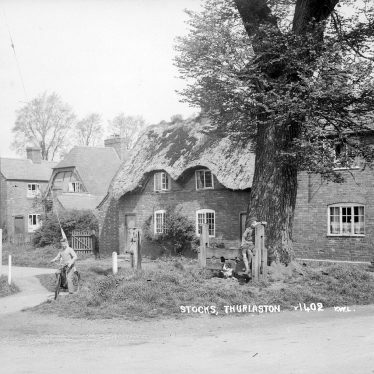 It is located to the south west of Thurlaston. The remains of ridge and furrow cultivation of Medieval and later date in the parishes of Dunchurch and Thurlaston. In some areas the ridge and furrow is visible as an earthwork. Elsewhere, the remains are can be seen on aerial photographs. This map shows markers for every photo, article, historic site and catalogue record within the Thurlaston category.